Its not very often that we photograph the many reef fish associated with the benthic ecosystems along the southern Palm Beach County coast. Many of these reef fish have venomous spines, sharp gill plates and teeth that are designed to shear through coral, let alone bone. We will try to include these fish along with a brief summary of their habits in our future reports. Columnist Manny Luftglass caught this gorgeous Midnight Blue Parrotfish while fishing a “guppy” rig on the bottom baited with squid strips. 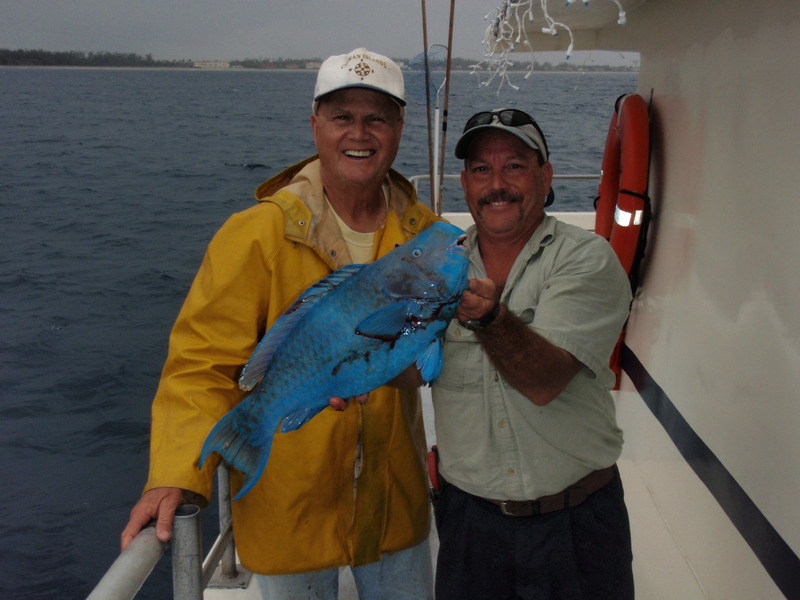 There are more than a dozen different species of parrotfish found along the reef systems off south Palm Beach. The parrotfish primary eats coral, using its hard fused teeth to break off large chunks, but will also feed on small crustaceans and mollusk. Many of the worlds most beautiful white sand beaches come from the “sand” that is produced as a by product of the parrotfish’s diet. Parrotfish are not commonly caught aboard the Lady K due to their diet and the fact that their teeth are like tin snips, commonly cutting the barbs right off. The Parrotfish is a very important member of the reef community and should be released after a quick photo. There are over 250 different species of reef fish living along the reef systems found in South Florida waters. Many of these fish are too small to be caught on hook and line, but those that can be caught will dazzle you with their bright colors and unique patterns. Drift fishing aboard the Lady K, its not just for sport, its a means to explore. Plan your offshore adventure to day and don’t forget to share it with your family or friends.